Bennett Brinson Gamel: Fighting Cystic Fibrosis: Happy 3rd Birthday, Avonlea! She's the cherry on top. Her bear hugs are our favorite. Her belly laughs are contagious. She loves baby dolls, princesses and dressing up. She hums the Star Wars theme song by memory and regularly plays "conflict resolution" with Bennett's Batman and Superman action figures. She feels like everyone is her friend. She has her brothers wrapped around her finger. And if she thinks you're cooking, she wants to be right next to you. It seems only yesterday we were announcing we were pregnant with this sweet girl. Today this little bundle of joy is celebrating her third birthday! 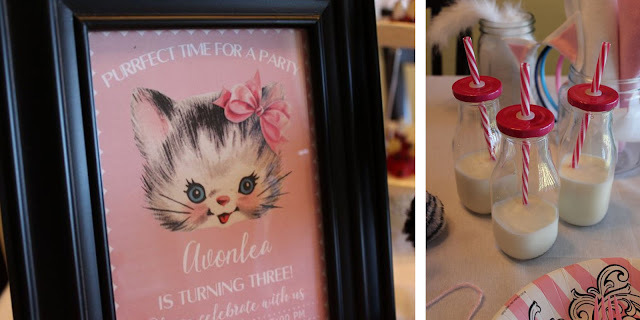 I thought long and hard about what kind of birthday party theme might best envelope who Avonlea is and what she's in to at this age. But it didn't take long for me to recognize that, when you're a little girl who wants to regularly be referred to as a kitty cat, a kitty cat themed 3rd birthday is the best. In order to keep birthday parties manageable as the children grow, Brian and I decided a few years ago create a family rule to limit the number of kids we invited to the children's party using their birthday age as a guide. So, this year, Avonlea invited 2 little friends to her birthday party. 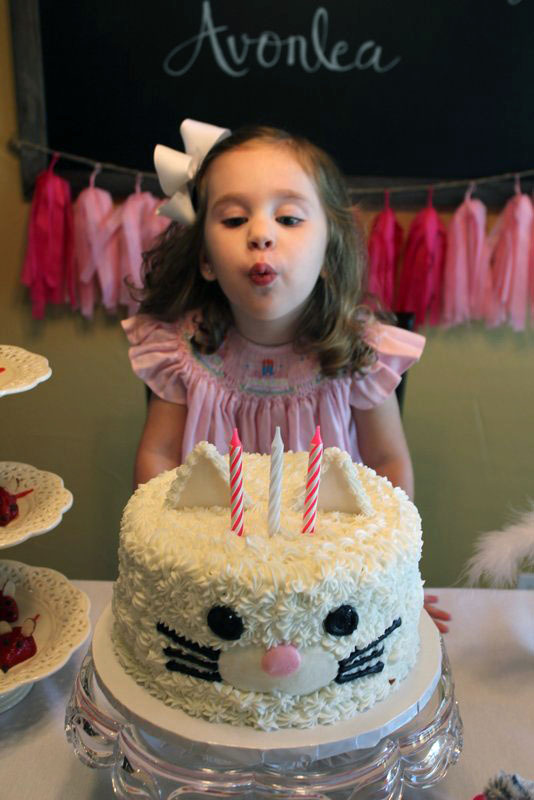 Avonlea was tickled pink over her kitty cat cake (which I found on Pinterest here and asked SimplyDelicious to make). Three is such a fun age because *everything* is the most wonderful. My favorite line that Avonlea regularly but randomly quotes is from Tangled: "Best. Day. EVER!!" The little girls enjoyed fresh milk with their cake because every kitty loves milk (milk glasses were found at Target in the Dollar Spot). Kitties also love mice. 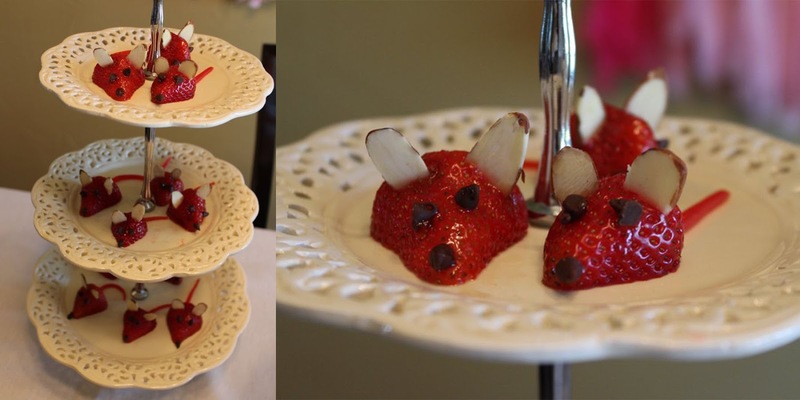 These little strawberry mice, found here, were made with strawberry bodies, almond sliced ears, mini-chocolate chips and pull-apart Twizzler tails. It calls for honey to keep the little eyes, nose and tails attached but I found honey to be a challenging adhesive. Nonetheless, they were fun to make. The girls mainly wanted to play with each other the whole time but one little activity I set up for them included "dressing up as kitty cats." I cut several white marabou boas into 8-inch long strips to be used as kitty tails. Felt, headbands and a hot glue gun were all that was needed for creating kitty ears. And then, to top it off, I also bought several pairs of white athletic socks at the dollar store and glued pink felt on them to make "kitty paws". We've been practicing all day, regularly asking Avonlea, "how old are you!?" She is still working on getting that new little finger to rise up with the other two. You couldn't be any more purrrrfect for our family, sweet kitty cat! Happy 3rd birthday, Avonlea!